By keeping track of the latest market developments, we are offering Tripod For Light. Our offered tripod is obtainable in different specifications to meet the demands of our customers. 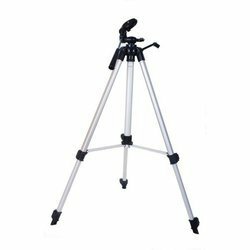 This tripod is well designed by making use of optimum quality material and the latest techniques in accordance with the set norms of industry. We are engaged in offering a quality approved range of Tripod Stand. 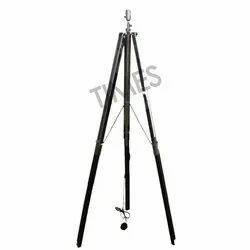 open frame wind resistant telescopic tripode, legs of long grained knot free treated aluminium/wood, large/medium plateform head with adjustable central-lock/side-lock clamps for batton, shoes with solid tips. The Stand has an adjustable knob to change and hold specific direction. Focusing is accomplished by adjusting the eyepiece ring on the telescope tube.Its Beautiful Nautical Polish Finish Marine Telescope All work is hand made. - Tripods heavy aluminum for total station. We have attained a notable position in the market by offering the finest quality array of Telescopic Tripod Stand. Our organization offers Aluminium Tripod Stand to our clients. This product is specially developed for providing maximum stability and strength. It can be used to support surveying instruments such as theodolites, total stations, levels and transits. We are leading manufacturers and suppliers of Tripod Stand made by 1" square iron pipe auto painted heavy board clip. Engaged in manufacturing and supplying tripod stand . Our range of Prism Pole Tripods made from aluminum pipe of 25mm dia. Telescopic in two sections, painted alternately with red and white water proof paint at 20 cms intervals, fitted with quick locking system, provided with water proof canvas cover.